What if our life turned into a cliché romcom? Released back on 13th February by Warner Bros Pictures, and directed by Todd Strauss-Schulson, isn’t it romantic is a sardonic romantic movie. Although it is still within the genre, the plot makes a point at showing how these movies create inaccurate expectations in the naïve minds of teenagers, especially females. Let’s dig in. Set in Australia, during the early 90’s, this is the tale of Natalie (Rebel Wilson) who gets knocked unconsciously during a subway assault and finds herself in an alternate universe. An exciting parallel world where her long ago dream of being noticed at her job and her skeptical vehemence for love comes out to be a beautiful reality in front of her eyes. In this startling, but beguiling pastel-bright colored film, all guys have charming personalities that girls can easily fall in love with. The pitch looks for a comedy that audience can relish by, watching the few crests and cracks in Natalie’s life, watching how she used to scorn rom-coms and was hypersensitive to all stereotypes of the Hollywood flicks. In the beginning, the young girl is spotted sobbing at Pretty Woman, after which her mother tells her that women aren’t supposed to get happy endings like that. Besides being underappreciated by her own mother, she is also kind of bullied at the office, where she works as an architect. This triggers her low self-esteem and when a wealthy client named Blake (Liam Hemsworth) mistreats her for an assistant it even drags her lower. However, it all changes when she gets in her own romantic comedy, after an altercation in the subway. She starts seeing New York streets through a new flair and her eyes see a charming and genial version of Blake and some more exciting journey adventures that were nothing more than an illusion before. As you can understand so far, this romantic yet comedy movie follows the recipe which has been done loads of times before. Like in most romantic comedies there is the one picturesque, charming and very rich romantic lead, who the leading female character dreams with. Plus, it develops the idea that women are shallow and are only concerned about wealth and appearance of their possible significant other. However, the love story gets more rip-roaring when she experiences twinge of jealousy. When she sees her other love interest, Josh, her best friend (portrayed by Adam Devine) with a beautiful yoga ambassador (Priyanka Chopra) she becomes green with envy and sets a competition-like against the other woman, named Isabella. Another stereotypical cliché in rom-coms here, showing the lead character involved in a love triangle and battling for the attention of a man. Haven’t we seen these enough times? Now, stop right there. What if the movie itself is a parody of the rom-coms clichés? Well, it turns out that after entering the usual love triangle, Natalie starts to find some details quite odd. When she is bleeped by ambient sounds, occuring every time she tries to swear, she realizes she is actually stuck in a PG-13 romantic comedy. Say what? Being covetous, after watching all this she sets out to undo everything, until she realized this, she started wooing her love and even makes a beautiful dramatic ceremony a nightmare for her by hitting the car and again getting knocked backed unconsciously. She again finds herself in the hospital, with a different story of having been in an induced coma for 18 hours where the dream ends into similar previous routine in a large dance number in a tinkling piano of Vanessa Carlton, in the streets of New York. Could it be anymore cliché? Notwithstanding, she has justified the character charisma with some super-satisfying expressions by nailing some good dose of digital fiction with humor. And last but not the least romanticism. Although, there is some rebellion, sublime and some sense and sensuality, story never went more romantic than three kisses in the entire film, which goes against the pattern of over ‘smooshing’ that you see in some rom-coms. 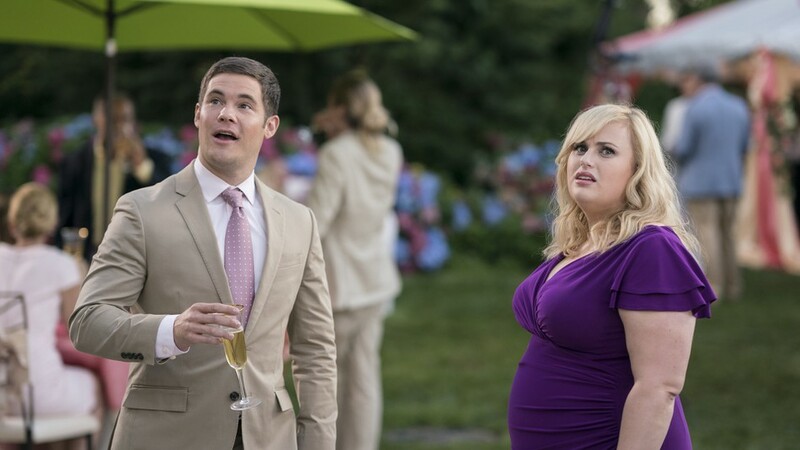 Apart from this, even though the star behind this blockbuster movie is Rebel Wilson, the credits for such an interesting concept should go the trio of writers Erin Cardillo, Dana Fox and Katie Silberman. The fact that three women were behind the script, probably shows why this movie portrays the overworked rom-com fantasy world in the eyes of actual contemporary females. Like the old saying says: ‘you can take a horse to water, but you can’t make it drink it’, and thus this movie shows that women have empowering personalities and with enough self-esteem they can’t be controlled or labelled by anyone. In a changing world, where women’s emancipation is raising and female characters are gaining protagonist roles, this is a throw against a genre of movies which might need adapting to current times. According to the Rotten Tomatoes altogether reviews rating this silly, yet subtly subversive movie got 70% Tomatometer rating based on positive reviews, Whereas, according to the audience score rating it got 51 % likes on whole. However, this movie earned its place in the pantheon of (romantic?) comedies by hitting the box office for 2.4 M revenue. Based on 23,911 users rating on IMDb, this movie got a 6/10 score and has generated the gross revenue of $44,881,064 in total up till now. According to IMDB, viewers feedback from Rebel’s performance throughout the movie was hilarious. She seemed like a beautifully dressed doll that gives inspiration to all chubby girls with a little bit of humor in that too. From the beginning till the end, the story went so smooth and interesting that viewers could not stop on more than one laugh out loud moments. All in all, it’s a fun, yet muddled film with a good message. It speaks little about what we fantasize as romanticism today. This movie is an open invitation to rethink of the concept of loving and being loved. The message it conveys is to reconsider what love is, what directions we are following? Do we have our own fantasy world or there are some concepts or adaptations that really need a change in demanding generation of today? So, grab your tickets and go out to watch this movie with your significant others, with your friends or family and get ready to debate all these questions in the end.